This Dr. Seuss The Cat in the Hat and Friends Statue by Jim Shore features the beloved characters from the iconic children's book perched for destruction. 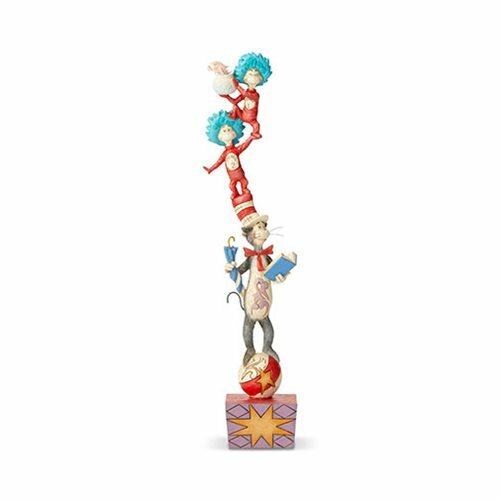 Whimsically decorated with folk art designs, this precarious totem combines the magic of Dr. Seuss and the artistry of Jim Shore. The mischievous crew poses atop an intricately handcrafted base adorned with colorful, eye-catching folk art motifs. Celebrate your love for the classic Dr. Seuss tale with this lively Jim Shore design in your collection! The Dr. Seuss The Cat in the Hat and Friends Statue by Jim Shore is made of stone resin. Measures about 12-inches tall x 3 1/0-inches long x 2 1/4-inches wide.